1. Decide that it will be a great day. This is the most important step. 2. Lie in bed thinking happy thoughts and envisioning your great day for an extra 15-20 minutes. 3. Get dressed and ready for the great day ahead. Put on something that makes you feel good. 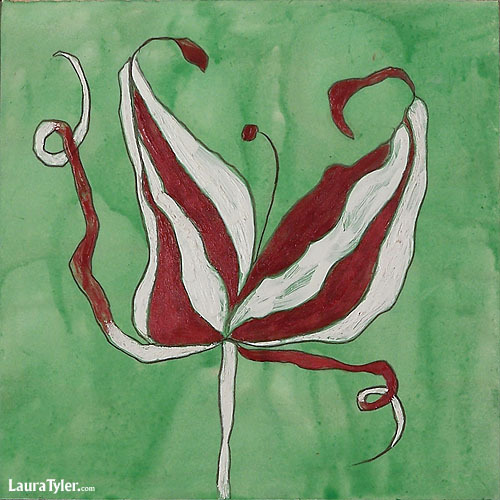 ©Laura Tyler, Mint Tulip. Used with permission. 4. Start the day with something inspirational: a podcast, a recording, a book, or a favorite (inspirational) blog. 5. Say hello to the sun and, in my case, the mountains. 6. Chug a glass of water. 7. Grab a cup of coffee or tea. 8. Eat breakfast and take your vitamins. 9. Check your email to make sure there is nothing urgent there, but don’t spend too long in the inbox (5 minutes). Note that this is #9, not #1! 10. Check your task list and prioritize what is most important. Repeat this step at least two more times throughout the day. 11. Tackle the task list. Listen to soothing music or sounds. My favorite CD these days is the sounds of the ocean, seeing as we have very little water here in the high desert. 12. Say Yes to the really good stuff and Thanks, but No Thanks to what doesn’t serve you. 13. End the day in good time. Look at your task list for tomorrow and plan your day. Mentally leave your studio or office and spend time with yourself or with loved ones. 14. Before going to bed, write your gratitudes in your journal. What are you thankful for today? Also, write what you accomplished during your great day and pat yourself on the back. Just as you started your day with an inspiration, you will end it with another inspirational ritual. 15. If you have a significant other, kiss them goodnight. Before turning out the lights ask him or her: What made you happy today? Be prepared to share what made you happy. 16. Say one last prayer of gratitude to the universe for giving you such an amazing day. 17. Sleep soundly for 7 to 8 hours. I find writing my gratitudes in the morning make me more apt to remember them through-out the day. And, thinking positive about everything through-out the day makes for much happiness. Doom and gloom would get anyone down…..get rid of it! Thank you, Alyson! I forgot to go over my task list and priorities this morning and it’s got me all wonky! Thanks for the reminder. Great list! Things I would add: Take a walk listening to music or just the world around you (non-biz podcast or fun audiobook OK) Say grace before starting to work — centers me around what I need to be doing. Calms me and makes me more purposeful to ask a blessing on the work ahead. If you get stalled or frustrated during the day, don’t push harder — instead take a few deep breaths and a five minute break. Then return to where you were when you got stuck. Dale Anne: I know lots of people write their gratitudes in the morning. I think this is great. I just prefer doing it at night before I forget the day. Maybe twice a day wouldn’t hurt! Leslie: I understand. I know what it’s like when I forget to check in with the task list. Sari: I love the thought of you listening to me in the bath tub. But, maybe that’s a better place to let go and unwind. Or maybe better to do one of my more inspirational recordings rather than a how-to. Susan: Terrific additions. The walk is something I need to work in and I failed to mention my yoga class, but I can have a great day without either. I do like the addition of saying grace (in whatever form you choose) before starting to work. great list Alyson! thankyou. I’ve been looking for ways to make my day more positive and efficient with time to wind down and enjoy myself rather than always running from pillar to post! Thanks a lot for the list. A lot of great ideas here. Some of them I currently us and others, especially number 17, I have some difficulty pulling off at times. Something that I find helpful is to remove myself from the information overload coming from the media. Especially right now. If I don’t limit my exposure to this I find it to be very draining. So I have replaced a lot of it with music and reading. Absolutely wonderful reminder list. I am going to paste this inside my journal and on the bathroom mirror! Every morning and every night (and throughout the day) I say what I am grateful for and then repeat my favorite affirmations. ” I am a successful, highly prosperous, full time artist”. “My art work is beautiful and it deserves to be shared with the world.” All is well in my world.” “I release fear and let go of doubt, I accept prosperity and abundance in all areas of my life.” These really do center and clam me and empower me! Jennie: Sometimes we actually have to remind ourselves to have a great day and to be more positive. Sari: That’s great to hear! Wanna send me a testimonial? Robert: Exactly. And you can’t even seem to be able to answer your phone these days with so many political calls. Terri: Use it for awhile, then come up with your own. And share it with me! Fiona: Yea. I’m working on some other artist affirmations right now. Yours are great. Bravo! The list keeps me going when I feel inundated with things to do and don’t have enough hours in the day! You are an inspiration to us! Keep them coming, Allison.